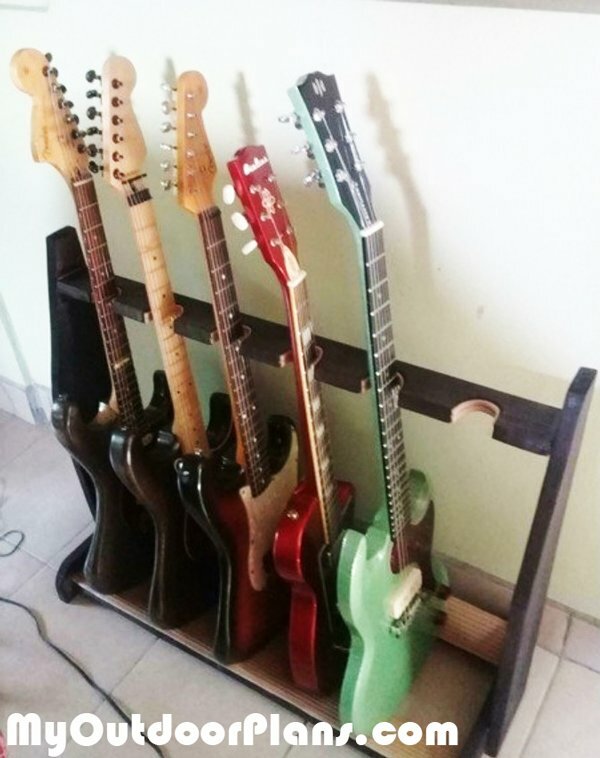 I had a 2.5x .35 meter plank of pine left over from a project here in Mexico, so I decided to build a much-needed guitar stand to save space in my cluttered music room. The board cost me about US 6 dollars. The sandpaper, stain, and rubber that I glued on the stand to protect the guitars cost another 10 dollars. I cut all the wood and sanded the individual pieces on afternoon. The next day I assembled the pieces with wood screws and glue, and sanded it that evening. The next morning I stained it with an alcohol based rub stain from Comex. Then I glued the pieces of bathroom non slip rubber along the bottom boards and in the cuts where the guitar necks rest. It isn’t perfect, but it sure is functional. Also, it was fun and easy to build.